PDF of Results classification: 44th Marconi Memorial CW Contest, Nov 2016. Adobe PDF of rules pertaining to the forthcoming Nov 2016 44th Marconi Memorial CW Contest. 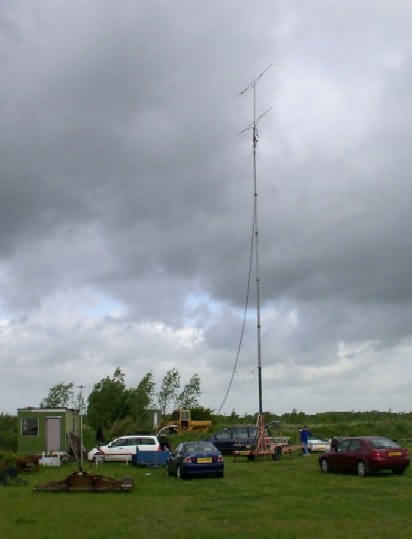 Amateur radio service gets new allocation New allocation for amateur radio service in the frequency band 5351.5 - 5366.5 kHz will maintain stable communications over various distances, especially for use when providing communications in disaster situations and for relief operations. 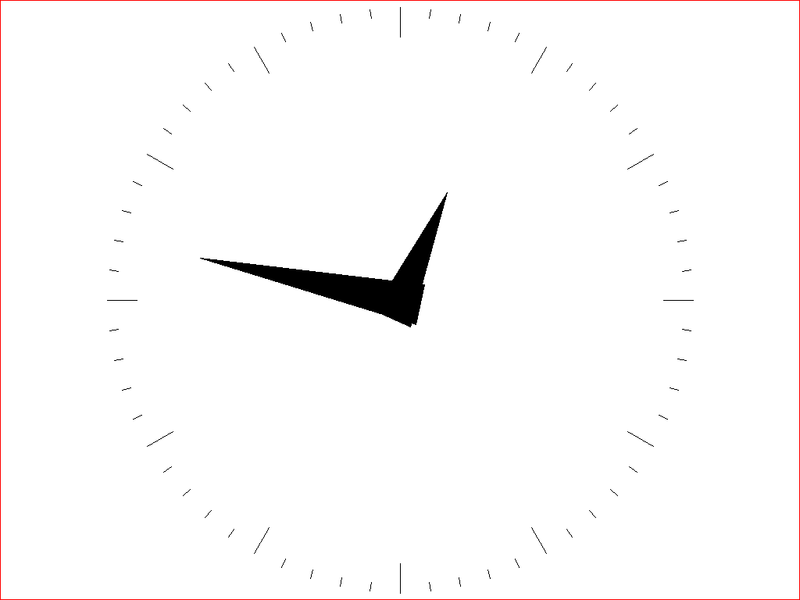 Universal Time WRC-15 decided that further studies regarding current and potential future reference time-scales are required, including the modification of coordinated universal time (UTC) and suppressing the so-called "leap second". A report will be considered by the World Radiocommunication Conference in 2023. Until then, UTC shall continue to be applied as described in Recommendation ITU-R TF.460-6 and as maintained by the International Bureau of Weights and Measures (BIPM). Adobe PDF. Official IARU Region 1 Contest Calendar for 2014 (Compiled by Alex IK3KKW). Adobe PDF of results and ranking of entrants to the Nov 2013 Marconi Memorial CW Contest. IARU Region 1 Conference in 2014 will be held in Varna-Albena, Bulgaria between 20th and 27th September. The website dedicated to the conference has been launched (24/01/2014) containing details of the programme of events, accomodation for visitors/delegates and tasters of future features during the conference. Realtime ADS-b receiver using an RTL DVB-T dongle connected to a 'homebrew' colinear aerial at one end and a Raspberry Pi at the other reveals aircraft tracks over South Eastern England and beyond. Sure, it's not FlightRadar24 but it shows what can be done with (someone else's) clever programming and simple equipment. BROKEN! Due to SYSTEM FAILURE. Will rebuild in time... NTP stats - GPS disciplined RPi at the core. RRDtool graphs of ntp time syncronisations. Adobe PDF of results and ranking of entrants to the Nov 2012 Marconi Memorial CW Contest. Every other Special Interest Group seems to be promoting the (ARM-based, credit card sized, Linux computer) Raspberry Pi, so why should HamRadio Contesting miss out? There's a Quicklink in the Software Utilities section (to the right) to download my .deb build of Tucnak-2 v2.48 for the Pi. Adobe PDF (210KB) of results of IARU Region 1 VHF Contest, September 2009 made available today. G-stations make a fair showing with G4DEZ taking 24th place and GM4ZUK/P in 31st in the Single Op section. Of the 19 Multi-Op G's entering we see 4 stations in the top 50. My own group, G0VHF/P, just scraping in at level 50! Well done! to everyone involved and Thanks to REF-Union (the French National Society) for adjudicating the contest and getting the results to publication so quickly. Adobe PDF (830KB) of results of Nov 2008 Marconi Memorial CW Contest. A thanks to you all. See you soon on MMC 2009. The Tucnak Contest Logger Version 2.25 is now available as a Debian (.deb) install package via the Tucnak Wiki (click on the Penguin!). This version supports all RSGB Multiplier contests through the "wizard" contest setup screens. Tucnak is an all new (linux) Contest logger that features keystroke and entry compatibility with the venerable (DOS) contest logger, TACLog, plus a host of additional features - including HF! (A windows-capable version using the Cygwin libraries is also available (but has some limitations in feature-set)). Colchester Contest Group will be deploying this logger universally during 2009; implementing a mix of Linux and Windows versions. Check it out via the M1CRO website page that has links to other Tucnak resources. 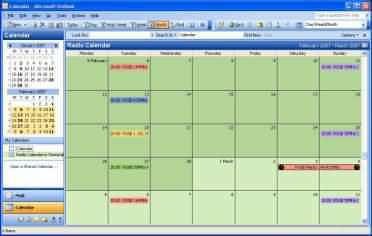 Last year, in an idle moment, while waiting for a (delayed) aircraft with a free W-Lan available, I made a stand-alone RSGB Contest Calendar in MS Outlook 2003. This year I note that Pete (G4CLA) has gone one better and produced both iCAL and Google calander formats that can be acquired via the vhf contest website "Calendar" page: http://www.vhfcc.org. In an idle moment, while waiting for a (delayed) aircraft with a free W-Lan available, I made a stand-alone RSGB Contest Calendar in MS Outlook 2003. 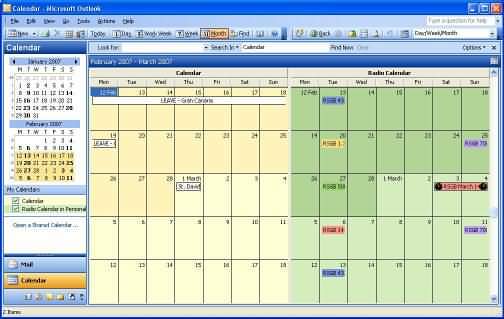 In Outlook 2003 more than one calendar can be loaded side-by-side with your general or QRL calendar. File | Open | Outlook Datafile. It is with great pleasure that I am able to provide a mirror of the "N1BUG Web" - the website of Paul, N1BUG. The site was mirrored just before being 'taken off the air' in late 2005 and has been archived since. This mirror enjoys full permission from the author and is being maintained to provide interest and encouragement to aspirational EMEers and hardened veterans alike. I have updated a few web-links (to maintain currency) and obfuscated a few email addresses (to deter spammers) but apart from that, the site is as-was. First reported European SpE of 2005. 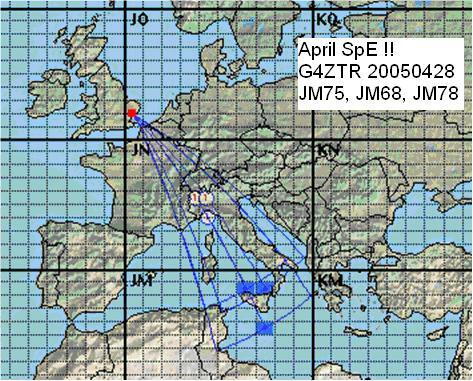 On 28 April 2005, between 14:00 and 14:15Z, G4ZTR (JO01) reports contacts with 9H - Malta and IT9 - Sicily. The BeamFinder plot indicates a "skip" region south of the Italian alps. F/G8APZ has been granted an 'F' callsign. Note that the group will now be signing F1VJQ on 144MHz MS and 50MHz. Within 5 minutes of turning on the equipment today (Thurs 8 July) the team experience their first (of many, hopefully) Es (SpE) opening towards the East. See the Logs via this page. 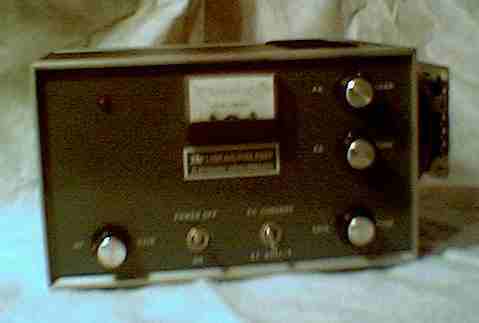 G8APZ and others will activate IN95 between 8th and 21st July 2004. 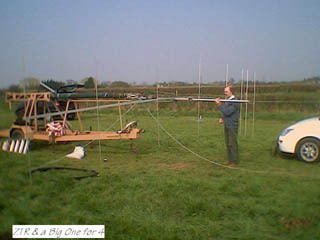 Equpment includes 3 pairs of significantly good ears, a single long yagi and full legal maximum. 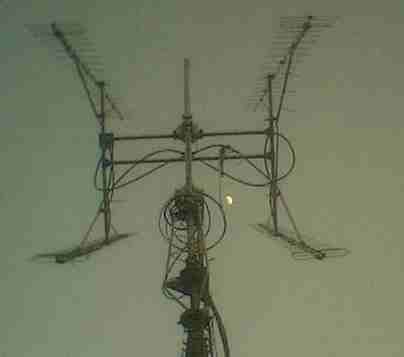 Image courtesy of AB7IY "Make more miles...."
70cms Beacons QSY from the .800/.900 range to the .400 range this year. Here are links to the 432 Beacon listings maintained by the Region 1 Beacon Co-ordinator. Thank you Iain! Fri 2003 05 23: Had time to review sizes of files - now smaller but retaining definition. Viewable on-line. Software registration form now posts data! If, before 24th April 2003, you have requested Perl source or filled in the Reg. Form... Please again? Any mail it produced has been consigned to the great electronic waste bit-bucket, somewhere in the wires! You'll find 'GetLocs.exe', Format_CW and both the Command Line and GUI Lookup programs available. Jump to the download page. The original site at http://www.m1cro.org.uk is becoming increasingly difficult to manage. In order to improve 'currency' I have replicated that site here for the moment (the original site remains at the original address (for posterity!)) The intention is to rebuild/redesign the M1CRO site over time. But first it is important to get things up-to-date. I will post recent Results and awards in due course and improve some of the linking. The original site will be given a new front page providing the option to continue in the 2002 time warp or to be redirected here for the more recent version. As this moment (April 2003) there are no changes. 2003/11/10 :: So! 'CodeRed' appears to be over. There have been no attacks detected for the whole of October and November. Of course the majority of these were the robotic activities of the worm's invasion of innocent Windows machines connected to an aDSL line, without a firewall. Regrettably things never really get better - its simply a case of moving on to block the next attack flavour. MIME worms and of course the MSBlast virus and its variants are currently in favour with the 'black hats'. Beware. 2003/09/01 :: Its getting better! Since first publishing this page, the incidence of 'Code Red' attacks has fallen considerably. The message from here and other sites is evidently getting through. That's the good news! There are still too many remaining though, IMHO. If your IP address is listed here, please review my original posting (below) and take the appropriate action. During October and early November 2003 there were no CodeRed attacks detected. I'm getting increasingly cross about the increasing (!) number of Code Red attacks I am seeing in my web logs. I am also starting to get suspicious. The bulletins about the Worm and the way to patch it on MS-IIS systems are almost impossible to miss! Perhaps there are hosts in this list that are deliberately harbouring the infection? Is your IP address in the list? Do you know that you have 'Internet Information Server' installed? Go here, here and here. It is in ~your~ interest! By beaconing in this way you are wide open to other, more menacing, attacks.